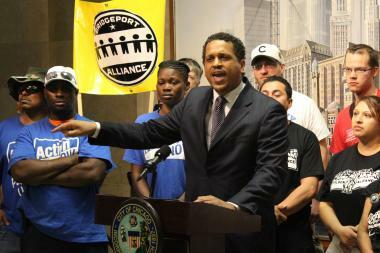 Blaine Elementary Principal Troy LaRaviere decried a CPS budget "that turns a full school day into an empty school day" at a rally earlier this year. LAKEVIEW — Blaine Elementary Principal Troy LaRaviere — a harsh critic of Mayor Rahm Emanuel and Chicago Public Schools officials — has been told not to publicly criticize the district in a formal warning that could eventually lead to his dismissal. The action comes months after Blaine encouraged a schoolwide opt-out to spring standardized testing at the school at 1420 W. Grace St.
On Wednesday, the Chicago Board of Education signed off on a warning resolution admonishing LaRaviere for engaging in "unsatisfactory conduct" and threatening him with dismissal if he continues. LaRaviere responded to the warning in a blog post Friday. "CPS is not interested in anything that contradicts its ideologically driven anti-public-school privatization agenda; an agenda which includes, among other things, over-testing students, and the diversion of public education funds away from students into the hands of private interests," LaRaviere wrote. While Chicago Public Schools posted only the first page of the warning — which does not contain specific offenses — LaRaviere followed up Friday by sharing the draft of the document he said he received. Forrest Claypool, the new district CEO, submitted the resolution. In the warning, the board blasted LaRaivere for comparing Partnership for Assessment of Readiness for College and Careers (PARCC) testing to exhaust fumes when responding to a parent and publicly siding with the Blaine PTA, which pushed to get all students to opt out of the two-week test. While CPS itself had concerns over the test, former CEO Barbara Byrd-Bennett told principals that failing to test eligible students put state funding at risk. In "direct public defiance of the CEO's directives," the CPS warning says, LaRaviere supported opt-out efforts, posting a principal's message on the school website and further elaborating on his blog, TroyLaRaviere.net. The board also noted that more than half of Blaine students did not take the test — the highest of any CPS elementary school. LaRaviere was also accused of insubordination and conduct "unbecoming a principal of the Chicago Public Schools" during a July 13 budget meeting. The board said LaRaviere "chose to defy the CEO" by demanding an answer to "a provocative question from the audience attempting to highlight financial missteps of the Board." The warning corroborates portions of LaRaviere's retelling of his interaction with former interim CEO Jesse Ruiz, who is also the board vice president. Both quote LaRaviere's blunt comments during the meeting, including his retort that Ruiz was "insulting the intelligence of everyone in this meeting" by "dishing [nonsense] out." The board directs LaRaviere to "not publicly take a stance that is in defiance of any directive, guideline, or rule issued by the Board, its designees or the CEO or his designees." It also instructs him not be insubordinate and to treat Claypool, his designees, Blaine staff and students "with respect and dignity." "If you disagree with any directive, guideline or rule issued by the Board or the CEO, or their designees, raise your concerns in a private respectful manner," the warning reads. But LaRaviere remained defiant on Friday. "I will continue to support all of my PTA's efforts on behalf of the children and families of Blaine, and I will continue to call out CPS on its reckless fiscal operational and educational mismanagement of our district at every opportunity they give me," LaRaviere wrote. "Unfortunately, for our teachers and the students they serve, those opportunities abound." Blaine's Local School Council renewed LaRaviere's contract in March despite his strong criticism of CPS. LaRaviere also served as an adviser to Jesus "Chuy" Garcia in his unsuccessful attempt to unseat Emanuel earlier this year.